My Scottish travel blog is one today. Looking back on 2016 and my first whirlwind year as a Scotland blogger. 12 months as a Scotland blogger! I’m a veteran Scotland blogger now! I can’t believe 12 months have passed since I tentatively dipped my toes into the World of blogging to start writing this Scottish travel blog. A World at the time that was completely alien to me. Instagram was my thing and I was an old pro at it. Part of a diverse group of Scottish Instagrammers, I loved sharing images and little snippets of information about Scotland. I’d received some pretty flattering recognition for my photos and had a loyal following so it was with more than a little trepidation that I tried on this ‘Scottish travel blogger’ hat for size and headed off along an unknown new path. I intended to craft my blogs around my photos but when they say a photo tells a thousand words you generally don’t need to write a thousand words to accompany it, unless you’re a blogger that is. A good USP for a Scotland blogger – where to start?! I wanted a hook for my Scotland blog, something to give it character and a unique selling point. While I wanted it to be informative and factual, I also wanted it to be lighthearted and fun. And then I found it, my USP and the hook for my Scotland blog – my beloved, travelling companion Casper the Westie, or as he’d now become known, The Wee White Dug. What’s not to love about a wee Scottish dug’s adventures around his stunning homeland? I found writing extremely satisfying and therapeutic. It was also amazing how I seemed to recollect things so clearly when I focussed my mind on writing. And then in June came the first contact from a local PR company on behalf of the Whisky Lounge and Scotch Malt Whisky Society. They wanted me to host a competition online to win a pair of tickets to the Edinburgh Whisky Solstice and there was a free press pass for me to attend too. I jumped at the chance as it was something different. I’d previously tried to get better acquainted with my national drink on the Isle of Islay with disastrous consequences. I’d have crunched into a cyanide capsule with more relish than I drank my nip of Bowmore 15-Year-Old Darkest Single Malt Whisky! This time was different I loved the whisky and the experience. I felt chuffed to have finally conquered my whisky fear. A terrifified Scotland blogger takes to the trees! Next came a slightly more terrifying fear than whisky – heights. I was invited to experience a Treetop Adventure at Go Ape Glentress Forest near Peebles. Whisky and swinging through the treetops. I was beginning to wonder just how I was portraying myself in my blog to be considered for such unique opportunities?! An adrenaline junkie with a penchant for hard liquor clearly! I found my treetop adventure terrifying and exhilarating. Mr G who I’d dragged along reluctantly, took to it like a duck to water. He zip-lined through the trees like he was auditioning for a 1970s Milk Tray ad. Afterwards he posed proudly in the car park with his certificate and there was even talk of having it laminated! I was just grateful to have both feet planted firmly back on the ground again and for the shaking in my knees to have died down to a mild tremor. Someone in PR land clearly took pity on me after my whisky and treetop shenanigans as my next blogging assignment was to enjoy a ‘Picnic with Mercure’ and a stay at the stunning and very dug friendly Ardoe House Hotel in beautiful Aberdeenshire. It had been a miserable summer but that weekend in late August the weather played ball and Mr G, myself and the Wee White Dug enjoyed a lavish picnic of tasty local produce in the perfect setting of Crathes Castle. It was bliss – sunshine, Aberdeenshire’s fairytale castles, stunning scenery and a sumptuous hotel stay. Being a history geek my next assignment was right up my street. As the leaves took on their gorgeous autumnal hues we headed to the UNESCO World Heritage Site at New Lanark. A historic cotton mill and mill worker village, it’s a fantastic visitor attraction and a really enjoyable day out. We loved meeting the friendly ghost of 10-year-old Mill Worker Annie McLeod. The nearby Falls of Clyde were an added bonus and the wee dug enjoyed a woodland walk, foraging through freshly fallen autumn leaves. As 2016 drew to a close and Black Friday fear gripped the nation, we turned our back on the consumer mass hysteria and headed for a scenic and remote spot in Lerags Glen near Oban. I was only too happy to support Embrace Scotland in a cause close to my heart by getting involved in their Paws for a Break campaign. The campaign aims to promote Scotland as the perfect destination for a pet friendly break. There’s nowhere more perfect in my humble opinion. We struck gold with our accommodation at Cologin Country Chalets & Lodges. It was a great base for exploring the surrounding area and we managed to pack loads into our weekend break. On the Saturday night when the on site country inn, The Barn had a power cut we ate dinner by candle and firelight and dubbed it Black Saturday. Calm, stress free and way more enjoyable that the horror of Black Friday. I adore Christmas but refuse to embrace it until December rolls around, so it was nice to get into the festive spirit this year with an early December visit to the Royal yacht Britannia for their Christmas Weekend. The yacht looked wonderful all decorated for Christmas. There was shortbread, mulled wine and a fun festive Corgi treasure hunt. There was also the best scone I’ve ever eaten and a fascinating insight into the historic yacht, which turned out to be nothing like I expected it to be. A great day out and a really enjoyable way to end my first year as a ‘Scotland blogger’. This year in between a varied array of blogging assignments I was honoured and delighted to be asked to become a Visit Scotland Ambassador. The Visit Scotland online community is something I’m incredibly proud of and it was wonderful to be involved from the very beginning. I’ve also put wellies, cagoules, backpacks and midgie sprays through their paces in the Scottish great outdoors so you could say that my first year of blogging has been a tad diverse. It’s also been hair-raising, interesting, a gastronomic delight and most of all a privilege and a huge amount of fun. It wouldn’t have been any of those things without you guys – my lovely readers who take the time to read, comment and encourage me. I can’t begin to tell you how much I appreciate you indulging me in my passion for sharing Scotland with the World. A big thank you too to those of you who’ve allowed me the opportunity to blog for you, making my first year of blogging a hugely memorable one. Tonight I’ll be raising a glass to toast you all on the first birthday of ‘Scotland with the Wee White Dug’ – slàinte mhath. And as I stop a while to reflect fondly on 2016 I look forward to exciting new opportunities for me wee Scotland blog in 2017. * I made it to the end of year two and it was even more fun! Here’s how 2017 played out. You’ve done a marvellous job with your blog! By far my favourite travel blog. I’m a little obsessed with Scotland. And my family all adore your great shots of the wee white dug. A very nice summary of highlights and what it’s been like for you. Thanks for the insight! You’re doing great, so keep it up in 2017. Can’t wait to see where you go next. Slainte mhath. Thank you for the posts and although I have only been here a short while, I have had great enjoyment from them. 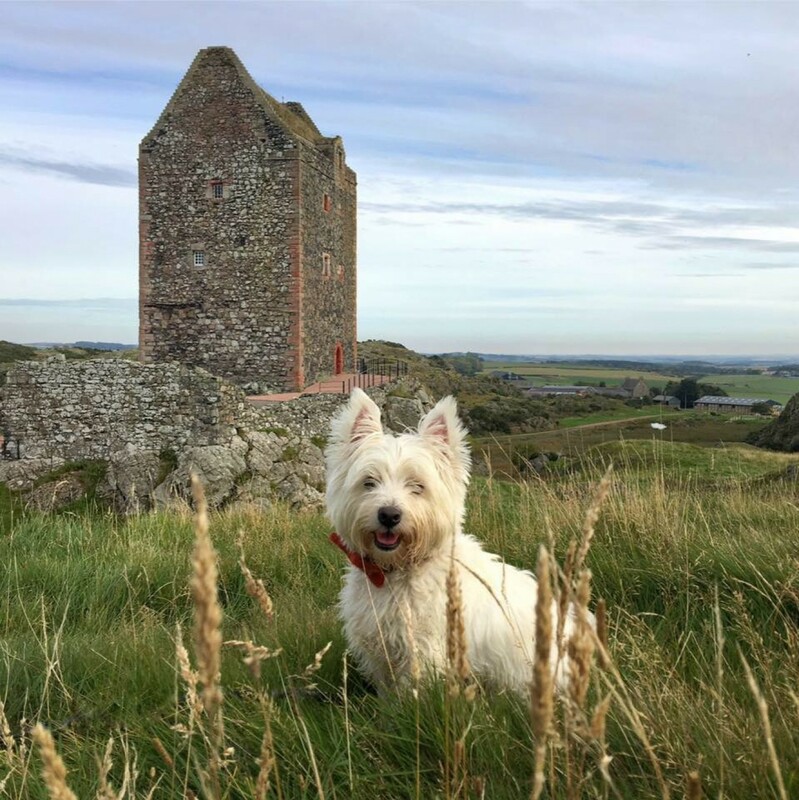 I look forward to next year and I will try to catch up on posts before I came – And you’re right, what’s not to love about a Westie in Scotland! Thank you for following along on our adventures. I look forward to hearing how your Scottish adventures go too. Thanks for a brilliant 2016! Looking forward to sharing 2017 with you and the Wee White Dug. God bless. Haha love your photo sporting the Navy cap! As I read your intro: “the adventures of a wee white dug in Scotland” the words “children’s book” sprang to mind….. hmmmm? Cheers and all the best for 2017. It’s been a great year. I may never get to visit Scotland, but your blog is the next best thing. My Corgis send their salutations to The Wee White Dug. Congratulation on you first year. And, greetings from Dallas, Texas. We have enjoyed your blog so much. We are ready to visit Scotland, and soon. Thank you – it’s been great fun. You really need to visit. Scotland is wonderful. Congratulations on your first year of blogging – I’ve enjoyed following you through the year. Thank you – it’s been great fun.